This guest house is located in Berlin’s trendy going-out Prenzlauer Berg district. 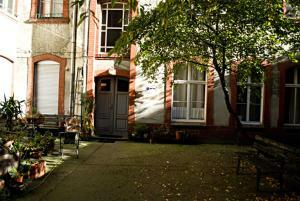 The guest house is 250 metres from Eberswalder Straße Underground Station. Eastside Pension is a classic Berlin-style residential building with high ceilings and large windows, overlooking a quiet courtyard. All rooms include stylish wooden furniture, cable TV and a private bathroom. The guest house is 150 metres from the Kulturbrauerei (culture brewery), the historic brewery converted into an entertainment complex. Many bars, restaurants, clubs and cafés are within a 5-minute walk. From Eberswalder Straße Underground Station, it is only a 10-minute journey to Alexanderplatz. Great direct bus and tram connections are also available to all parts of central and eastern Berlin.